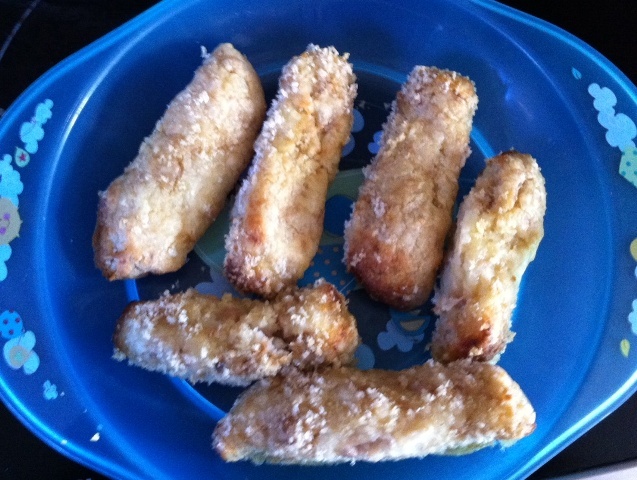 I had some leftover mashed potato after dinner on Monday, so I decided to try the Tuna Croquettes recipe from the Baby-Led Weaning Cookbook. These couldn’t be easier to make. 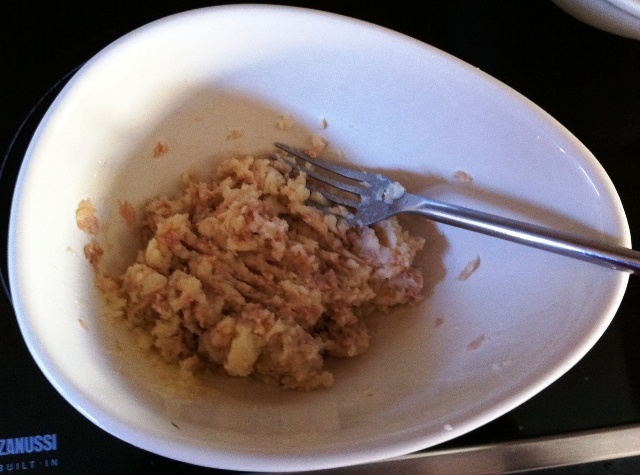 Take your leftover mashed potato (preferably about 2 large potatoes worth), add a small tin of tuna (stored in oil, not brine! ), and squeeze the juice of a lime into the mixture. Mash it all together with a fork until it’s mixed well. Then dip your hands in some flour and have fun shaping the mixture into sausages. Actually, the flour is optional, but trust me, if you don’t use it, you’re just going to end up with a sticky mess all over your hands. Once you’ve finished shaping the sausages, roll them in some breadcrumbs, and then that’s it. They’re ready for the oven. Bake them for about 20 minutes at 200C/400F/Gas Mark 6. I actually cooked them in the Halogen Oven, so they only took about 15 minutes. You’ll know they’re done when they’re golden brown on the outside. I served them with steamed green beans and carrot sticks. Little Man gobbled them up. I had a couple leftover, so I reheated them for lunch the following day, but for some reason he refused them completely when they were reheated. Maybe he was just objecting to being fed the same thing two days in a row! He’s funny like that sometimes! But they were definitely a big hit when they were fresh from the oven. Try wet hands instead of flour when making the sausages.